The right bathroom is a place where you can unwind and wash away the day’s stress. Each person has a different idea of what that looks like. 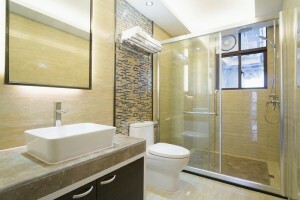 At Scherer Enterprises we can bring that relaxing vision to life with the perfect bathroom remodeling in Vancouver, WA. As with everything we do, Scherer Enterprises bathroom remodeling contractors begin by listening to you. We take a look at the current design and compare that with complaints and desires you have with your bathroom. We take as much time as necessary to get a feel for your style and plans for the use of your bathroom remodel. Do you prefer a rustic look or perhaps the simple straight lines of a Japanese-styled bathroom? Do you need to add a sink to make the bathroom more functional for your family? Once we learn what you have in mind, we work with you to design the bathroom remodeling project you have dreamed of. You can be as hands-on or hands-off as you like; in the end, the design will be one that you love and approve of before our expert remodeling contractors in Vancouver, WA begin. We work with a large variety of top of the line brand names and design options. No matter your style, you will find it here. Remodeling from Scherer Enterprises can combine bathroom remodeling options that upgrade the look and functionality you have in mind, whatever your budget. From small changes like refinishing the cabinets and flooring to expanding the space and moving walls and home additions, our bathroom remodeling contractors in Vancouver, WA are skilled and capable. 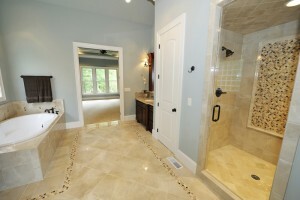 Why Choose Scherer Enterprises for Your Bathroom Remodel? There is a reason so many of our customers are referred to us by other satisfied customers. 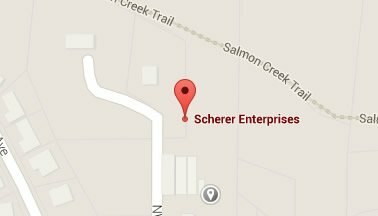 At Scherer Enterprises the job we are doing right now is the only thing we focus on. With great attention to detail and an eye for elegance, our craftsmen do each bathroom remodeling project as though it were their masterpiece. We get the job done on time and on budget, every time, whether it’s a kitchen remodeling job or complete custom home. We are honest, upfront, and open with all our communication and pricing. You will feel like we are a partner in remodeling your bathroom, not a dictator and an absentee contractor. Ask us about our options for green materials as well as the ways we can make your bathroom more energy efficient. We love adding value and beauty to your home while also making it more eco-friendly! Contact Scherer Enterprises today to discuss your Vancouver, WA bathroom remodeling possibilities!